Beto O'Rourke speaks at the Texas Democratic Convention in June. The winner of the party's U.S. Senate primary has embraced progressive positions — at times including impeaching President Trump. GOP Sen. Ted Cruz takes a photo with a supporter during a rally to launch his re-election campaign on April 2 in Stafford, Texas. Cruz says he's taking O'Rourke's campaign seriously. Rep. Beto O'Rourke, the Democratic nominee for Senate in Texas, greets supporters at a cafe in San Antonio. "Let's make a lot of noise so the folks in the overflow room know we're here, that we care about them," O'Rourke tells the crowd at the town hall, before counting to three and leading them in a cheer of "San Antonio!" While he was sorry that all of those supporters couldn't see him, Beto O'Rourke is an unapologetic, unabashed liberal who has shown no interest in moving toward the political middle after his victory in the Texas Democratic primary. 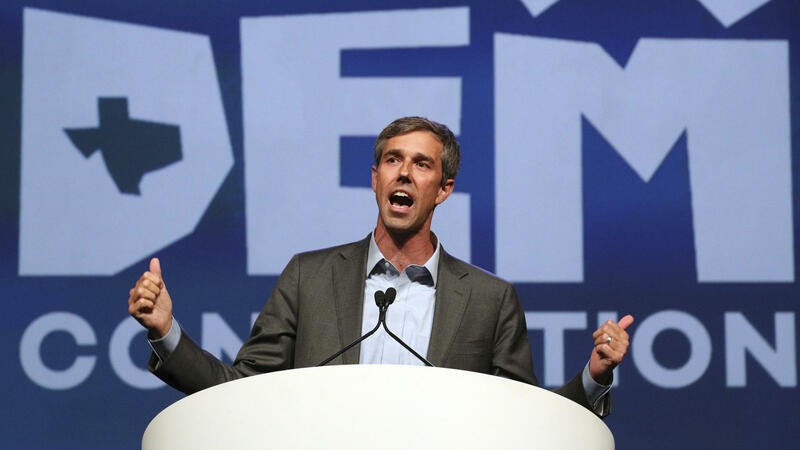 On issues like universal health care, an assault weapons ban, abortion rights and a higher minimum wage, O'Rourke has staked out progressive positions. The Democrat even raised the specter of impeachment after President Trump's Helsinki press conference with Vladimir Putin — although O'Rourke has since walked back that position some. Nevertheless, recent polls have him just 2 and 6 points behind Cruz. Compare that with the 20-point walloping state Sen. Wendy Davis endured in 2014 when she lost in a landslide to Republican Greg Abbott in the race for governor. But that recent history begs the question of whether someone running as far to the left as O'Rourke can actually win in a state like Texas. Former Texas agricultural commissioner and Democratic populist Jim Hightower sees something different in O'Rourke's campaign. "You've got a Democratic constituency that is fed up, not just with Trump, but with the centrist, mealy-mouthed, do-nothing Democratic establishment," Hightower said. "They're looking for some real change and Beto is representing that." Cruz says he is taking O'Rourke's candidacy very seriously. 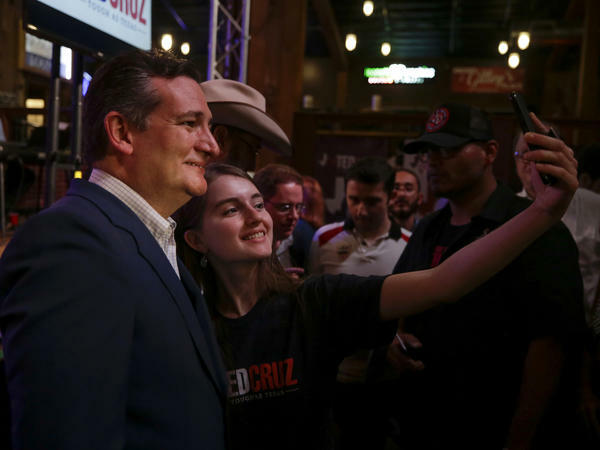 "I think the decision he's made is run hard left and find every liberal in the state of Texas, and energize them enough that they show up and vote," Cruz said in an interview with NPR. "And I think he's gambling on there are enough people on the left for whom defeating and destroying Donald Trump is their No. 1 issue, that he's hoping that's his path to victory. I don't see that in the state of Texas. In Texas, there are a whole lot more conservatives than liberals." When it comes to the critical issue of immigration, the two Texas candidates for Senate couldn't be further apart. Last week in Temple, Cruz indicated he supports ending birthright citizenship telling the crowd, "It doesn't make a lot of sense." O'Rourke is against building a wall along the border and favors a gradual path to legal status for immigrants in the country illegally. Political observers in Texas say it's still too early to get a good read on the race, although it seems that O'Rourke's campaign is generating some momentum. Jim Henson, director of the Texas Politics Project at the University of Texas, which does extensive statewide polling, says the key to O'Rourke's success thus far is that he began his campaign early. "He's much more viable, he's been working harder, he's traveled all over the state. He started earlier than the statewide candidates that we've seen in recent years, and I think it's made a big difference," Henson said. Still, Henson believes an O'Rourke victory is probably a long shot, not for lack of effort or fundraising, but because of the advantage Republican candidates enjoy in Texas when it comes to the sheer numbers of voters. "In a 100-yard dash, [O'Rourke] probably starts 10 to 15 yards behind," Henson said. At a café in San Antonio where he has come for an interview, O'Rourke is mobbed by customers who recognize him and want a picture with him. The congressman patiently chats up everyone who approaches and agrees to pictures. He urges his fans to share the photos on social media, a likely unnecessary piece of advice. With the recent separations of immigrant children from their parents who are seeking asylum at the Texas border, immigration is hot topic of conversation. O'Rourke also supports protections for immigrants who are in the country illegally after being brought here as children, known as DREAMers. "I think that this state, the most diverse state in the country, should lead on immigration," O'Rourke told NPR. "Free DREAMers from the fear of deportation, but make them citizens today so they can contribute to their full potential. That is not a partisan value, that's our Texan identity and we should lead with it." O'Rourke seems to have no fear of sounding too progressive for Texas. He has no interest in moving toward the ideological center for the general election. He borrowed an old line from Jim Hightower as way of explanation. "The only thing that you're going to find in the middle of the road are yellow lines and dead armadillos. 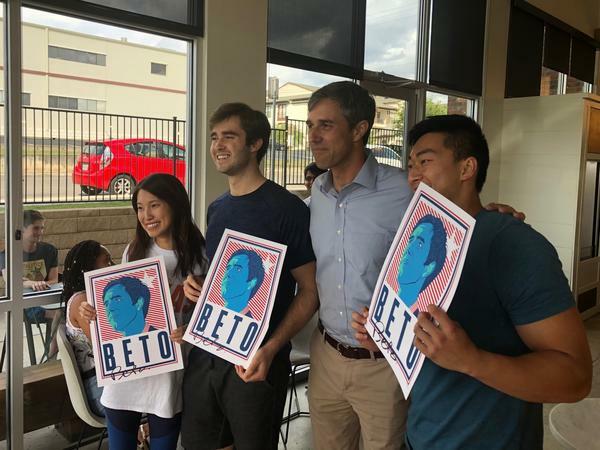 You have to tell the people that you want to serve what it is you believe and what you are going to do on their behalf," O'Rourke said. "We can either be governed by fear, fear of immigrants, fear of Muslims, call the press the enemy of the people, tear kids away from their parents at the U.S.-Mexico border, or we can be governed by our ambitions and our aspirations and our desire to make the most out of all of us. And that's America at its best."